I am in Chicago right now for a conference and forgot to load new photos on my computer before I left, so here is an older one. It is from this summer (which I miss now in the Chicago wind) during Bible Preaching Week sponsored by the Baptist General Convention of Missouri. 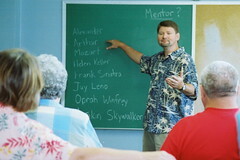 The funny part about this photo is that right above the speaker's head is the question "Mentor?" It is almost like the question is being asked about him instead of by him.